Our lochside lodge in Scotland is ideal self-catering accommodation for groups. 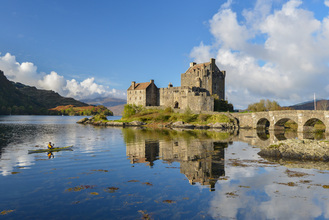 It’s a great base for a Highland holiday exploring nearby Isle of Skye, Plockton, and iconic attractions such as Eileen Donan Castle. The local area is home to a wide range of wildlife and otters are spotted regularly from the Lodge on the shoreline. The Lodge is an excellent base for discovering this wild and unspoiled area, steeped in history. Stromeferry Station (is next to the house). The train from Inverness continues through to Kyle of Lochalsh. There are 3 trains in each direction everyday. Inverness (2 hrs), Kyle (25 mins). There are buses to Kyle of Lochalsh from Inverness, Fort William, Glasgow and Edinburgh. The nearest bus stop is in Auchtertyre 10 mins drive away. ​The loch and mountain scenery is spectacular in this unspoilt area of Scotland’s west coast. Stationmaster's Lodge is a handy base to explore the magical Isle of Skye, mighty Torridon, North Coast 500 and the Applecross Peninsula. Eilean Donan Castle, wildlife boat trips and the delightful village of Plockton are all within a 20-minute drive away. If you would like more information about the location of our lochside lodge, please do not hesitate to contact us. Although our lochside lodge feels remote, drive time to Portree is less than an hour, Inverness and Fort William one and half hours. You can of course arrive by train, with services from Inverness. In fact, you could take the sleeper train from London to Inverness and then take the local train to Kyle of Lochalsh alighting at Stromeferry Station opposite the house! If you would like more information about our lochside lodge, please do not hesitate to contact us.